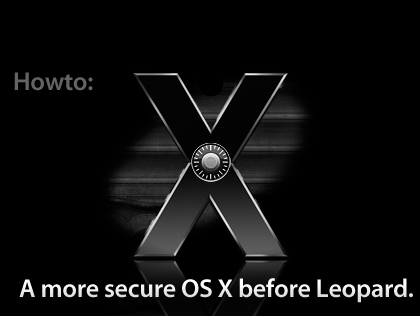 10 Mar Howto: A more secure OS X before Leopard. There is no need to copy settings and stuff, in order to work as a non-administrator. Instead, create a new account, make this new one the administrator account and remove the administrator property from your usual and firstly created account. That’s what I did, and it works just fine. No problem gerddie, it’s good to have it emphasized. Thanks again. Block UDP traffic? Are you an idiot? ed. : I have cited this comment for exempliary reasons. I am not making a howto to make the most media-center like user-friendly networking out-of-the-box Mac. I am making a how-to in which I advise what you can do to break future exploits. If you have no use for UDP and want to filter it, this document may be of help. I advise of the breaking of services and more, at least two times. Any idea why this failed? and then type sudo ipfw del 20322 again. The reason for the new error was that 20321, the rule, was already deleted. You can now go on and delete the other one, if you like. “secure OS X beyond it’s default settings” should be “secure OS X beyond its default settings”. Can you switch to dark text on a light background? 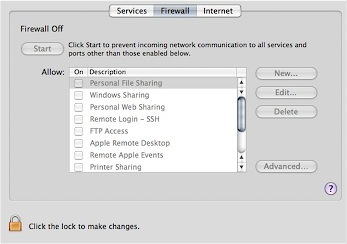 What good is it to turn on your firewall when you have no services running in System Preferences->Sharing->Services? If no services are running, then any requests on those ports will go unanswered. In this case the firewall does nothing for you. Its like locking all the doors on a house that has no doors. Scratch that. I re-read the part about Bonour and CUPS. Firewall on is good. Nice read. Patrick – As soon as I saw the white on black text, I pressed ctrl-option-Apple-8 and inverted the colors on my screen. Made it much easier to read. Check under System Preferences -> Universal Access -> Seeing if it’s not working for you. Glad you edited your first section with gregr’s suggestion, but then you hit me with the F-word. Your tutorial is too colloquial. Too kiddie speak-like. I can’t take you seriously. I’m very sorry. For you. Nor can I. Good primer and extra steps to take–my only concern regards using the command line to configure ipfw, and mixing it with using the Control Panel GUI, as i’ve heard that it’s not recommended to mix them together. Any comments about this? No, not really. First, there is a GUI for firewall rulesets, even for OS X. It’s called Waterroof – and it’s free. Second of all, you can always disable your firewall. No problems there. The issue, I think, that you’re afraid to run into, is that the GUI would delete manually-inserted rules, or leave otherwise manually tweaked rules alone, breaking the configuration. Now, I wouldn’t worry about that unless you are defining very broad ranges of ports, addresses, or connections to specifically deny, instead of allow. the error you saw was on the second of the compound command. When you ran it a second time, 20321 was already deleted, so it errored out. you shouldn’t run commands like that unless you’re 100% sure of what you’re doing and are almost as sure that nothing’s gonna fail. with &&, it gets harder to understand what went wrong as you add more commands. The firewall is a way of insuring that services are NOT running and no application is able to receive connections on blocked ports. If some rogue piece of software decides to listen for connections on port 143, without a firewall, the service will go unchecked and will become a security risk. Running with no services and no firewall is a false sense of security. Running with no services and with the firewall on is like building a wall around your house with no doors. I only wish that the OSX firewall had a built-in rule editor for both inbound and outbound rules and be configurable on a per-host basis (ie: allow inbound ssh, but only from a specific host). 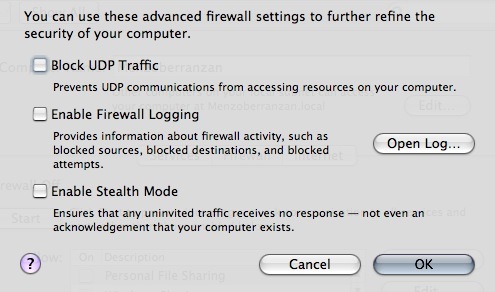 Important Note: “Blocking UDP Traffic” will also disable Windows networking folder access. Actually it doesn’t disable it, it just won’t allow the Windows computer and the Mac to communicate (effectively disabling it). Ed. : Actually, a persistent rule in the table which I advise to get deleted is NetBIOS. This in the later how-to, but Windows File Sharing is supposed to pass through the firewall, at least, with default settings, no matter what you do in the configuration GUI. Nice. Not bad. Slightly enlightening, but I had to go screw with the firewall to get a netcat listener going for me anyways. Didn’t play with the advanced settings though. I really liked your article. A bunch of good tips. Thanks. Ed. This may or may not be clear, this is the NSA’s guide to hardening OS X, which I will touch on more in my next howto. As far as the UDP/Stealth options go, I wonder if XP has similar options? Most corporate solutions for firewalls, and I believe even the XP SP2 Firewall deny ICMP-Echo Request (Stealth Mode) or have an option for it. I always used Norton’s backend, Sygate Personal Firewall. UDP Filtering can be turned on by disabling sensitiv UDP services in the advanced preferences of the XP Firewall. Great post. Thanks for sharing that. I was going to write an article about this but it looks like you’ve covered it pretty well. Stealth mode vs Internet sharing – users will become blocked after a short period of relative silence as the firewall sees them as new attempts at connecting to you. Also add privoxy for privacy issues to browser use (no need for tor for most of us) the most great filtering proxy software for users. Also check Directory Services utility – most home users would need none checked, except maybe bonjour, and a polluted dhcp server could hand control of your machine over to whomever polluted the dhcp server. JunkMatcher used to be great for adding more junk filtering controls for Mail. Might come back. ClamXav is early but add some applescripts, enable clamscand, and you can have an interactive opensource virus/phising/worm etc scanner to warn you that is updated up to 4 times and hr. Please read the new follow-up. Link is, well, everywhere. If nothing else, I recommend turning on your logs so that you can SEE what sort of traffic is coming in/out. What action you take after that would be dictated by what you need/don’t need. Why didn’t you mention that Dashboard phones home? I have pressed it to the heart that people use Firewall accesories like Glowworm FW or Little Snitch, to see exactly what phones home. A complete list of things that phone home would be; Pages, iPhoto, Keynote, Microsoft Office Test Drive, and several others. great reading!, one thing, it’s a good idea to setup the firmware password on Macbooks/Macbook Pro, if the computer is lifted it’s pretty well useless to anyone and your data will be protected. The firmware utility can be found on your install disk or on Apples download page. In this howto, the author will show you some things he has done to secure OS X beyond it’s default settings. There are very basic, and some advanced things in here……. 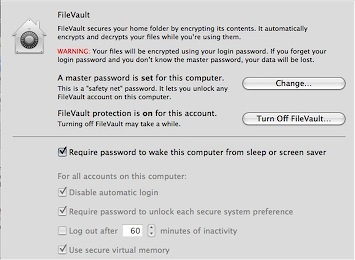 This two part (1, 2) article has some great tips for securing Mac OS X…. Projeto OSX86 Brasil » Blog Archive » Mais sergurança no OS X antes do Leopard. Hardening OS X - A more secure OS X before Leopard. « Get all your mac news and more in one place! Cocoia Blog » Scanning my audience (split). MyMac.ca » Hardening OS X - A more secure OS X before Leopard. Cocoia Blog » Debunking MacLockPick.